Who will come after Vallas? 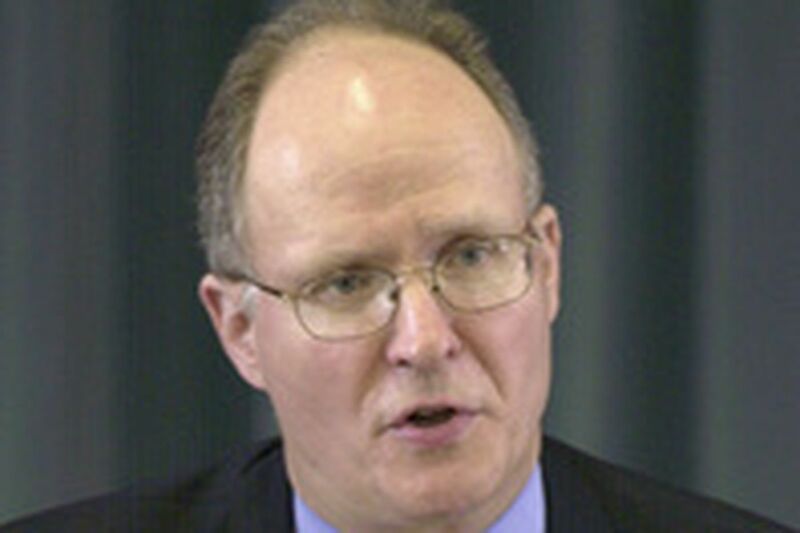 Paul Vallas, shown in 2003 photo, is ending 5-year tenure here. AFTER NEARLY five years of steady leadership and relative financial stability, the School District of Philadelphia now finds itself looking for both. Yesterday, Mayor Street and others speculated on who would take the helm of the 174,000-student district in the wake of the Wednesday announcement by Chief Executive Paul Vallas that he's quitting after this school year. Though Street and Vallas did not get along at times, the mayor said he had nothing to do with Vallas' planned exit. He said if he had to grade Vallas, he'd give him a "B" because of the district's budget deficit. And he said the job of replacing Vallas should begin immediately. "I think it would be very inappropriate to say, 'We're going to wait for another almost year to select a replacement,' " Street said at a news conference. For his part, Vallas stepped away from the fray yesterday. He was in Washington among a group of school officials who met with President Bush to discuss the federal No Child Left Behind law. Sources have said Vallas has told his bosses on the School Reform Commission that he plans to take the job as superintendent of New Orleans' Recovery School District. Neither Vallas nor commission members will confirm that move. Street said he had two candidates in mind to replace Vallas, but declined to name them. He said he'd first talk with Gov. Rendell and James Nevels, reform commission chairman. "There are a couple people, one of whom is local, and another is from out of town. One is a person that I think [expressed] some interest in the job some years ago," Street said. Asked about Pedro Ramos, the city managing director and former Board of Education president, Street said he wasn't one of the two about whom he was thinking. "Though I didn't think of him in that way, this is something he might be able to do," Street said. Carey Dearnley, a reform commission spokeswoman, said yesterday: "Before Monday, the School Reform Commission will be meeting to discuss the process for creating a national search, and if need be, to appoint an interim CEO to succeed Paul Vallas." * Thomas M. Brady, named last month as the district's chief operating officer. Since 2004 he had been chief business operations officer for Washington, D.C., schools. * Michael Masch, state budget secretary and a former member of the reform commission and the old city school board. * Gregory Thornton, the district's chief academic officer. Thornton emerged as a contender about noontime yesterday, after he withdrew his name from consideration to become superintendent of Seattle schools - a job he expressed strong interest in as late as Wednesday. He could not be reached for comment yesterday. "There haven't been any discussions yet about specific candidates," Dearnley said when asked if Thornton had decided to stay put to position himself as Vallas' successor. "He has grandchildren here and he decided that uprooting the family to go so far away was not a desirable option," school district spokeswoman Cecilia Cummings said of Thornton's decision. Eric Braxton, an adult organizer for the Philadelphia Student Union, a student group, said: "My sense was that Thornton was interested in the CEO position when he came here. I think he thought Vallas would have left earlier. So I wouldn't be surprised if they are now considering Thornton." And Shelly Yanoff, executive director of the nonprofit organization Philadelphia Citizens for Children and Youth, said: "If it's Michael Masch, he certainly knows the school district. He certainly knows numbers. And he certainly knows the state. He's a trusted voice. We could certainly do worse." Press aides for Masch and Rendell declined to comment about the speculation. "It's not a person that you have to replace, it's a system," said Theodore Hershberg, a professor of public policy and history and the director of the Center for Greater Philadelphia at the University of Pennsylvania. "It's another white knight, whether he's white, black or pink. And it's not going to work or change anything because it's the system that has to change," added Hershberg, who contends that along with overhauling the entire education system, teachers' pay must be increased to attract and keep only the "best and brightest educators." Though Vallas said he'd leave the district with a balanced budget, his successor will still be taking charge of a financially strapped district. Vallas' last budget - for the 2007-08 school year - must be adopted by the reform commission by the end of May. At the moment, Vallas has balanced that spending plan based upon assumptions that the city and state will contribute an extra $82.5 million and he'll be able to cut spending by $99 million. A budget-highlight document that Vallas' office released yesterday states that funding for academic reforms would be reduced by $21 million, charter schools by $6 million, management and productivity by $48 million, personnel costs by $12.5 million and debt service by $11 million.